Established in 1997, OUR PARISH RECORD SYSTEMS (OPRS) is a dynamic solution focused company with a strong focus in developing software solutions. 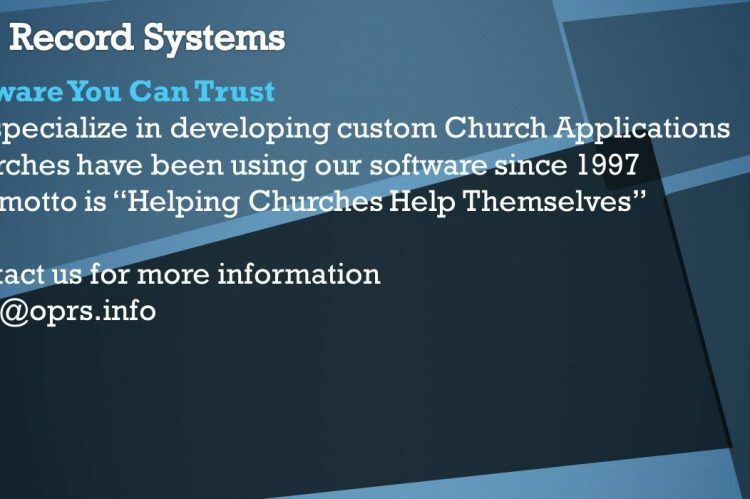 We provide high tech solutions to a diverse customer base of Churches and Schools. Our company draws its expertise from a team of experienced individuals with scientific and engineering backgrounds. Our primary focus includes, but is not limited to providing software based solutions, web site solutions, small & large database design and providing technical training & support. Helping Churches help themselves. We believe that anyone with the proper tools & support can become more productive using technology. Our philosophy is built on the fact that we can learn as much from our customers as they can learn from us. If we work together as a team we can improve the tools and our understanding of how to use them.